Since 1932, Litton Engineering Laboratories has been a leading manufacturer of Glass Working Lathes , chucks and burners servicing the scientific glass apparatus, laser, high intensity lighting, fiber optic, vacuum tube and art glass markets. Litton glass working lathes are also used in the fiber optic preform manufacturing industry as the base machine used in deposition lathes (MCVD), collapse lathes, sleeving lathes, fire polish lathes, and elongation lathes. In 2000, Litton expanded its product line into a full service, stocking distributor of borosilicate glass tubing & rod , along with glass working equipment and supplies. Litton provides extensive customer service in the areas of telephone consultation and instruction, field service, lathe maintenance and repair, and rebuilding/remanufacturing of Litton lathes. 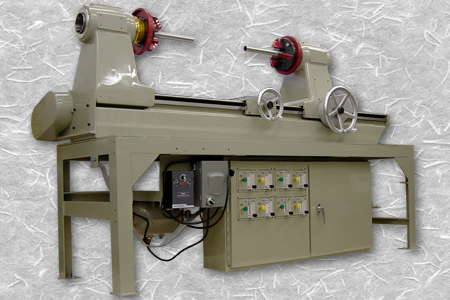 Litton also buys and sells used glass working lathes and equipment. For Sales and Service contact Joe Morphew at 530-273-6176 ext 27, Lathe maintenance Tim O'brien at 530-273-6176 ext 28, Engineering, contact Gary Koopman ext 21. Thank you for choosing Litton Engineering Laboratories for your glass working needs. 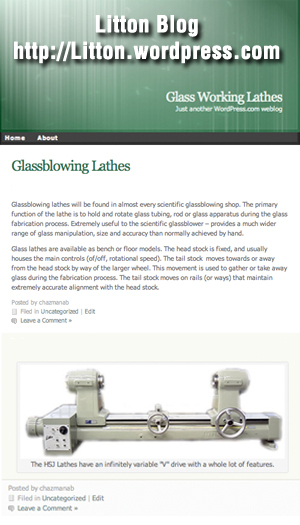 Litto nEngineering Laboratories is a proud member of, an active participant in and supporter of the American Scientific Glassblowers Society. Due to its unique properties, glass continues to be an essential component of industry, science, art, and our everyday world. The American Scientific Glassblowers Society is dedicated to providing continuing education for its members and maintaining the successful association between scientific glassblowers and all of the various enterprises which entail glass fabrication. The ASGS is a professional, nonprofit, organization of scientific glassblowers and associated members who are interested in the art of scientific glassblowing. The objectives of the Society are the promotion, gathering, and dissemination of technical and scientific information concerning all aspects of scientific glassblowing. mailing list to receive your free 120 + catalog of classes and events, go to www.glasscraftexpo.com and click on mailing list registration. This will put you into our database to receive all updates on the show. Showcatalogs will be mailed out late October. Online registration for class / hotel will begin early November, 2009.